The Exit Intent popup reacts when a visitor tries to leave your webshop. It pops up and displays interesting products, possibly converting a leaving visitor to a buying customer. 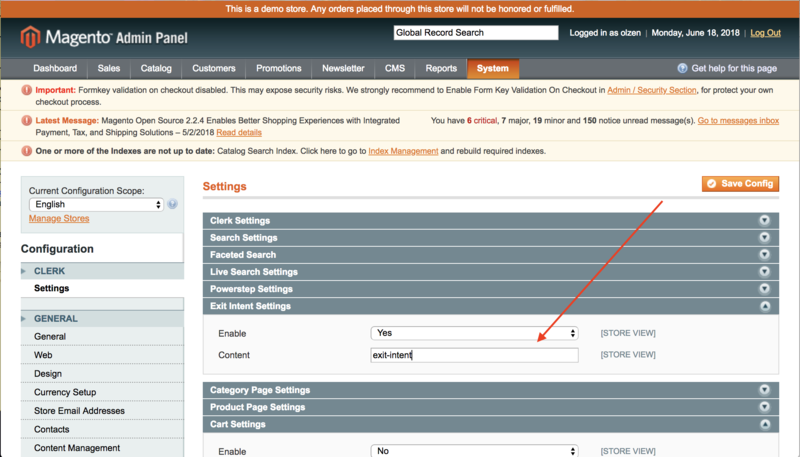 From v3.1.2 of the Magento extension, Exit-Intent can be activated directly from the extension. 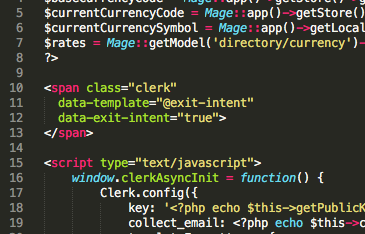 Make a new of Website Content in my.clerk.io and name it "Exit Intent"
In the Magento backend, go to System->Configuration->Clerk Settings and choose the correct store-view for your store. Locate Exit Intent Settings. Set Enable to YES, and make sure that the Content field contains "exit-intent". Click Save Config to activate it. Now customers will see the exit intent pop-up the first time they try to leave the page. Choose the right logic for it - We suggest "Visitor Recommendations". Add data-exit-intent="true" to the embed code you just placed. All recommendations containing data-exit-intent="true" will trigger the Exit Intent pop up.